In today’s conversation, I’m speaking with Greg Salciccioli, the CEO of CoachWell – an executive coaching service that specializes in Professional, Team, and Organizational development. Special thanks to Cody Foster (one of the Founders of Advisors Excel and someone who has personally been coached by Greg) who first introduced us. During our conversation, Greg and I dive deep into the biggest problems he’s seen in his 18+ years of coaching financial advisors and what to do about them. If you’re looking to reach high net worth individuals, provide better service to your clients, and do right by your coworkers, your family, and yourself, this is a must-listen. [08:42] Why Greg’s new book took shape around the 7 Enemies of Excellence, what they are, and why high achievers – especially financial advisors – so often fall prey to them. [14:56] Why awareness and high emotional intelligence are so crucial to reaching higher net worth clients, upgrading your services, and relating to people – in an even more meaningful way than ever before. [20:00] The crucial mistakes many financial advisors make, but may not be aware of – and how to flip the script and offer solutions to your clients’ problems instead of services they don’t need. [23:14] How Greg found his retirement advisor and what about her approach attracted him to wanting to work with her. Not only that, but he explains exactly why he decided to “release” his previous advisor – BTW, if this is how you operate, it could cost you your next high net-worth client! [45:29] Greg shares some sage advice for financial advisors who struggle to find and keep talented staff and how to turn client issues into opportunities. [05:48] What Greg learned from one of my favorite business authors, Patrick Lencioni – and Patrick’s great strength that informed Greg’s own life and personal practice. [10:14] The crucial weakness Greg discovered that brings down so many ambitious leaders. [11:00] How to assess whether your ego serves yourself or others – and what to watch out for. [14:06] Brad introduces Greg to the 5 Minute Journal. [15:58] How Greg helps successful financial advisors who may not be aware that they have huge egos become self-aware – and turns this into a meaningful learning experience. [17:47] Why active listening and asking great questions are key to becoming better negotiators and salespeople in service of your clients. [18:24] The actual test Greg gives his coaching clients to determine their listening skills. [22:32] Why talking too much in meetings – and not asking enough questions – puts a hard cap on so many financial advisors’ salaries. [23:30] The questions Greg would incorporate into his first meeting with a new client if he were a financial advisor. [27:11] How Greg found his retirement advisor – and the reasons he built a long, sustainable, and lasting relationship with them. [30:09] Why Greg released his previous financial advisor – and what they did wrong that they still may not be aware of. [32:44] What financial advisors have to do to step up their game in order to attract and retain high net worth individuals. [38:03] Why it’s easy to lead from a position of weakness – and a real challenge to lead from genuine strength. [40:17] Greg shares a story of watching a billion-dollar leadership team meltdown because of a bad meeting that lasted less than 10 minutes – and what could have been done to prevent it. [43:01] Why bad habits breed like rabbits, lead to indulgence, and unravel so many achievers – and how having a trusted group of people with whom you practice self-disclosure can help protect you. [50:58] Why affirmations have to be true to really resonate – and what you can do to make affirmations even more powerful. [52:00] How Greg coaches Type A personalities to allow people to make mistakes as they learn – and how to bond clients even closer to you by being honest. [55:59] Greg’s favorite book he ever read and how it impacted his life. [57:46] Who Greg thinks of when he hears the word “successful” and why. [59:18] Why Greg thinks the way we text and email right now is absurd – and how he’d like to see ongoing, engaging dialogue change in the next 10 years. [01:03:18] The one piece of advice that helped lead Greg to success. Thanks for checking out the latest show! I really appreciate the reviews as it helps me figure out which guests resonate with you all and helps the show get discovered! Also quick ask, if you haven’t left a review yet, we are literally 2 away from the 100 review mark if you want to help push us into the triple digits would be grateful! Wow, thanks for the review and kind words, I love that the podcast is your go to source for industry knowledge! Your thoughts on starting the day earlier and turning off the radio takes me back to advice I received from Darren Hardy many years ago… with the amount of time that most Americans spend in their cars, they could literally have a PHD of their choice within a year or two if they’d simply choose to educate themselves rather than listen to music or talk radio and that’s exactly what you are doing. Stay after it! Thanks for the kind words and taking the time to leave the show a review! Michael Port’s advice is spot on as I’ve seen him literally transform our clients presentations within 30 minutes of working with them, night and day difference. So for those of you out there who missed that episode and grow your business by speaking from the stage, be sure to go back and check it out, he’s a master of his craft. Thanks for the review! More well deserved praise for Michael Port, he is the man. Glad to hear his advice is helping you out from the stage. Michael’s framework is the best when it comes to engaging an audience! Thanks for listening in Andrew! I love seeing the compound effect of this show inspiring other advisors out their to start up their own and you do an incredible job with yours as I’ve given it a listen. Have some exciting news coming on that front very soon, so for those financial advisors out there wanting to start a podcast, stay tuned, more to come there… and Andrew, appreciate you taking the time to leave us a review, thanks man! [00:00:25] Brad: Welcome to the Elite Advisor Blueprint, the podcast for world-class financial advisors. I’m Brad Johnson, VP of Advisor Development and Advisors Excel and it’s my goal to distill the best ideas and advice from top thought leaders and apply it to the world of independent financial advising. In today’s conversation, I’m speaking with Greg Salciccioli. He’s the CEO of Coachwell, an executive coaching service that specializes in professional team and organizational development. Special thanks to Cody Foster, one of the founders of Advisors Excel and someone who has personally been coached by Greg who first introduced us. Greg is also the author of Enemies of Excellence which explores why high achievers so frequently struggle with broken relationships, self-indulgence, disorientation, disarray, and a lack of professionalism. Patrick Lencioni, one of my favorite business writers, describes it as a wakeup call for people in positions of leadership and influence who want to preserve their organizations, family, self-respect, and peace of heart and mind. During our conversation, Greg and I dive deep into the biggest problems he’s seen in his 18 plus years of coaching financial advisors and what to do about them. If you’re looking to reach high net worth individuals, provide better service to your clients, and do right by your coworkers, your family and yourself, this is a must listen. Here are just a few of the highlights we get into. First, we discuss why Greg’s book took shape around the seven enemies of excellence, what they are, and why high achievers especially financial advisors so often fell prey to them. Next, we get into why awareness and high emotional intelligence are so crucial to reaching higher net worth clients, upgrading your services and relating to people in an even more meaningful way than ever before. Next, we get into why awareness and high emotional intelligence are so crucial to reaching higher net worth clients, upgrading your services, and relating to people in a way that’s even more meaningful than you ever have before. [00:02:22] Brad: Greg then walks us through the crucial mistakes many financial advisors make during client appointments but may not even be aware of and how to flip the script and offer solutions to your client’s problems instead of services they don’t need. Then Greg shares how he found his financial advisor and what about her approach attracted him to wanting to work with her. Not only that but he explains exactly why he decided to let go of his previous advisor. And by the way, if you happen to be doing this unintentionally, it could be costing you your next high net worth client. Finally, Greg shares some sage advice for financial advisors who struggle to find and keep talented staff and how to turn client issues into opportunities. Okay. 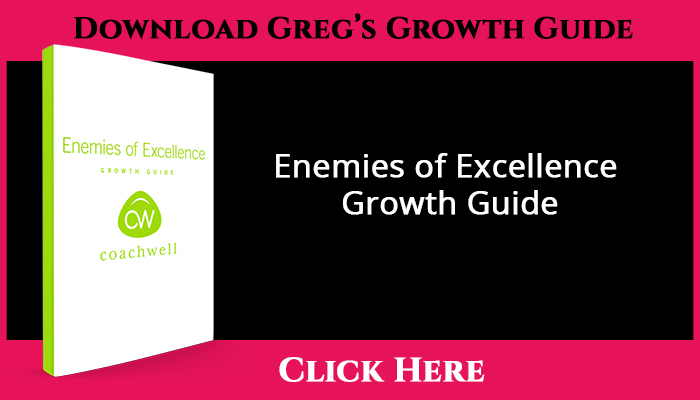 Before we get to the show, Greg went above and beyond for all of you Blueprint listeners by offering you a free download of his Enemies of Excellence Growth Guide. It’s a 48-page companion to his book to help you walk through and implement the ideas with your team. It’s available at BradleyJohnson.com/46. That’s 4-6. As always, show notes that include links to all the resources, books mentioned, people discussed are available there as well. And because what is an Enemies of Excellence Growth Guide without the actual book? Here’s what to do next if you’d like me to mail you a free copy of Greg’s book. All that I ask is that you leave an honest review out on iTunes for our show. You can visit the link BradleyJohnson.com/iTunes or if you’re listening in on a mobile device it’s usually as simple as scrolling down to the rating section. Once you’ve left a review, just drop us an email via brad@bradleyjohnson.com with your iTunes username and best mailing address and we’ll drop you a copy in the mail as a thank you. That simple. So, that’s it. As always, thanks for listening and without further delay, my conversation with Greg Salciccioli. [00:04:13] Brad: Welcome to this episode of the Elite Advisor Blueprint. I’m joined by my special guest, Greg Salciccioli. How are you, Greg? [00:04:22] Greg: Nice job, Brad. [00:04:23] Brad: I nailed it. [00:04:26] Greg: That is not an easy name. [00:04:27] Brad: No. Especially when you grow up in Kansas, it’s really hard actually. But anyway, I’m super excited, Greg. You’re the CEO of Coachwell which is an executive coaching service that specializes in professional development, team development, and organizational development so kind of all three pillars. I’m jealous. You’re based out of Bend, Oregon so I’m excited. We were introduced by Cody Foster, one of the founders of Advisors Excel I know who’s done some coaching with you so I’m excited to dig in today. So, weather is good out there in Bend? [00:04:57] Greg: The weather is amazing out here in Bend. We’ve got fresh snow right now. I can see outside. It’s just like a snow globe. It’s beautiful. Fresh powder in the hill. We’ll be up on it tomorrow so, yeah, this is a really good day. [00:05:11] Brad: Awesome. Well, I’m just going to dive right in. I just finished your book actually this morning, The Enemies of Excellence. So, for those of you tuning in on video, I’m going to be digging into this. I’m holding it up right now. I’m going to be digging into this today. It’s not that thick of a book. You crammed so much information. This is one of the best books I’ve read in the last couple of years and I say that not just to build you up at the front end of this conversation, but I was just blown away by the stories that you built in here and I know we’re going to just dive right in today and talk about how that applies to financial advisors out there. So, if you’re good to run, I’m just going to dive right in, Greg. [00:05:45] Greg: I am. I’m ready to go. [00:05:47] Brad: Okay. Let’s do it. So, first off, anytime I open a book and then a guy named Patrick Lencioni is right there at the front saying how awesome it is, that’s a pretty good sign that I’m going to keep reading. He’s one of my favorite business authors. So, if you have any Patrick stories real quick you want to share, feel free to share them, how you guys connected or anything like that. [00:06:07] Greg: I think one of the fascinating things about Patrick is he carries his journal everywhere he goes. I mean, I’ve sat in meetings with him and he pulls that journal up and you can just see him. You can see his wheels are spinning. He’s taking information, thinking, and he is a great speaker, but I had seen him in a strategic setting and it’s amazing how he operates. So, to me, I think active listening is one of his key characteristics, honestly, and if you use a pad of paper or if you use a journal or if you take notes on your phone, just listening first before you respond was one of the most impressive things that I think I’ve learned from Patrick. And it has become I think one of my milestones for me to operate in is just to really have that active listening process. So, that’s one thing. He’s super funny. I ran a Hood to Coast with him and he’s just hilarious. So, I think it’s just fun to do a Hood to Coast. We’re up for like 24 hours. You go out and run, you get back in the rig and you run around and get stiff as a board and you get out and run again. So, I think just appreciated his humor. He loves his family. He’s just a really good guy and a really good friend. [00:07:23] Brad: And so, you ran a 24-hour race with him? [00:07:25] Greg: Yeah. The Hood to Coast is really an interesting race. You go from really the Oregon coast to Portland. Actually, from Portland, sorry, it’s opposite. From Portland to the coast and then you have this big event and it’s just a 24-hour race and different people in your car get out and run and they get back in. The next guy goes out in a run or the next guy gets out and run. You get a couple of hours of sleep, maybe at a park or just in the car. I mean, you’re really tired but it’s a super fun race to connect with people and there are thousands of people that do it and this is really, really fun. [00:08:06] Greg: You actually do. Yeah. And yeah, this is a definitely interesting time for sure. [00:08:12] Brad: Well, I’m going to read a little bit about what Patrick said and then we’re going to get into the book. He says, “According to Greg and his theory makes a lot of sense, there’s something inherent in being a person of influence that creates a likelihood of pain and self-destruction. This book is a wake-up call for all people who find themselves in positions of leadership and influence and who want to preserve their families, their organizations, their self-respect and their peace of heart and mind.” So, yeah, let’s take this and let’s just dig in. I won’t steal your thunder. Why don’t you go ahead and share with the audience here, the actual seven enemies of excellence and since we won’t have time to get into all of them in our conversation today, I know we talked about beforehand we kind of hand-selected based on a lot of work and coaching you’ve done over the last 18 years working with a lot of financial advisors out there, kind of the ones that you see creep up the most in our industry. [00:09:09] Greg: So, I think, Brad, it’s important to talk about first why do great people, smart people, brilliant people, wealthy people, actually a lot of times who were in high levels of influence why do they sabotage their success? And I found this really interesting reason why. The reason why is many times successful people are so busy pursuing success that they’re not stopping for a moment to think about, how do I sustain it? There’s one thing to build success but to sustain it over a long period of time and be consistent, that is a challenge. So, what I found with people who I like to call people who are action people have a great quality and that’s many reasons why they build great organization, that’s why they get so much success, but action people have a weakness and that weakness is many times they don’t take great care of themselves. They allow themselves to get into a rhythm that is overachievement that has dangerous elements built into it. So, when you talk about the seven enemies of excellence, it really does begin with ego is really the first enemy, Brad, and that we all have an ego and ego is important. Confidence and ego is important but which direction is that ego pointing? That’s the issue. Which direction is that ego pointed? Is it pointed towards building something great for my clients, for people, for families, our staff? Is it that direction or does that ego have that tricky part of and building something that is important for me that validates me that makes me seem important, that makes me significant? If we can stay more towards this altruistic reasoning to build something great to improve clients, families, community, our world, build great leaders in our staff, that is a safer place to deposit our ego. If it’s more on the side of I’m searching for significance, that’s when it gets sketchy. [00:11:16] Brad: Yeah. That’s something it’s interesting. I’ve been dealing with financial advisors and coaching financial advisors for, man, I feel like I’m getting old, 11 years now and since the early days of Advisors Excel and what I see is sometimes as the level of success creeps up, the ego starts to creep up right along with it and we’ve got these blind spots that start to come in that sometimes people don’t even realize they’re there. So, what are some things that you do as a coach to start to help your clients become more self-aware about some of those blind spots that may be coming then? [00:11:49] Greg: First of all, Brad, I need to practice a little bit myself because I’ve been blessed with some great opportunities and I think I’ve had to turn and recognize, you know what, first of all, many people contributed to my ability to being successful. I think that’s important to look around and remember even if you look back at coaches, teachers, family members, other leaders, so many people have poured into you, to me, to us, I think it’s important to look back with gratitude I think is really helpful for us to stay in the right mindset. It brings us to a point of humility. I think humility is so underrated today. It really is a valuable, valuable character asset and so I think if you can – and I do this with myself even this morning. I was just reviewing people who have so much significant input into my life. That is helpful. I think it’s very, very helpful and so we tried with all of our clients and say actually have them create a thankful list. Who are the people that they’re thankful for who have contributed in their life in a significant manner? And what it does is it moves you to humility, Brad. I mean, if you look back in all the people that had it built into your life, Brad, I mean, think about it for a moment. I mean, it’s just people who have stopped in their busy lives, they built into you, they built into me, I’m just so grateful for them. So, I think that is really helpful to begin to have people and then they even look at their own staff around them. Those people are valuable. They’re precious. They are a part of the success that we get too many times celebrate. We couldn’t do it without them. No man, no woman, gets to a point of great impact on their own. It just doesn’t happen. And so, I think that’s a great starting point is for people to do some reflection, create that list to be grateful for, practice gratitude daily. If you honestly just sit up for a moment and write down 5, 10, 15, 20 things today that you’re grateful for, it puts you in a beautiful mindset to be even more successful. [00:13:57] Brad: I don’t remember. We might have covered this over dinner because we have the chance to share a dinner at my house when you were doing some coaching here in Topeka. The Five Minute Journal, have you heard of it? Do you use it? Do any of your clients use it? [00:14:12] Greg: I have not heard of the Five Minute Journal but I like the concept right away. Yeah. What is it? [00:14:17] Brad: Essentially, that’s what it is. I think I first heard about it on Tim Ferris’s podcast but it’s a quick little what are the three things that you’re most grateful for. And then so it has kind of a morning routine and an evening routine. It’s amazing how when you wake up in the morning, you know, sometimes there are those mornings where you’re just in a funk. You get out of bed. I don’t know what causes it. It’s just sometimes you’re not but if you immediately start your day and say, “Man, my family is healthy. We’ve got a roof over our head. Life is good,” and you actually sit there and just be self-aware for a second. It’s amazing how like with a snap of a finger you can pretty much snap right out of it, but most people don’t get to that point. Okay. So, I’m curious, speaking of self-awareness, sometimes the individuals with the biggest egos don’t realize they have the biggest ego. So, as a coach, how do you start to walk someone through that? And maybe you’re speaking to a financial advisor out there that’s been super successful, how do you start to realize, “Man, maybe I’m getting a little bit out of control here?” I mean, what are some triggers or some keys or tips to seeing that yourself? [00:15:22] Greg: Would you like to coach? And we do coach a lot of financial advisors and the key that we try to help them with is, “Look at your mindset. How do you approach in your day?’ Because emotional intelligence today really is the most effective game changer for any financial advisor. Emotional intelligence is where it’s at. Even Patrick in his latest book, The Ideal Team Player, talks about three things: humble, hungry, and people smart. You see, it’s not just being intelligent. That’s helpful. A great planner is helpful but what are your people skill sets? And so, we always challenge all of our advisors. Let’s look at your people skill sets. Awareness, by the way, is the key, the golden key, Brad, that unlocks the door to high emotional intelligence. If you’re more aware, you’re going to be able to there also monitor your behavior and correct it. You’re going to also mind your emotions as a place to be able to utilize it and more effective service to people reaching higher net worth clients and also be able to upgrade your services to people. It all comes down to how well can you relate. So, only every client that we work with, we work on their listening skills. Are they able to actively listen? We have them test that, test it at home, test it in their key relationships. We expose them to the virtue and the power and the acumen of active listening, powerful questions. Those two skill sets will help them be better negotiators, better salespeople, but also be able to serve their clients much more effectively in a more efficient, by the way, effective time because financial advisors are scrambling for time. Where can I find more time to meet with more people, so I can serve them? Well, if you actively listen, you’ll get to a need faster and be able to meet that need more efficiently and more effectively. The client will feel like they were heard, they feel like they’re more honored and then that client is able to you can go ahead and close a meeting, send them on their way, and you’re on to you have more time to meet with more people in a weekly period. [00:17:27] Brad: What’s a good test that you give your clients to start to understand am I a good active listener or not? [00:17:33] Greg: I’ll ask them to repeat back so, “What have you heard me say in the last two minutes?” If they come up with a blank look, that means they were so busy trying to respond, they really did not hear me. And I’ll model it to them. All of our coaches model active listening so, “What I’m hearing you say, Brad, or what I’m hearing you say, Greg.” And so, we actually are required all of our coaches go through extensive active listening to model it so if the client picks it up and in time, they’re doing it all the time. It’s just more of a natural soft skill that really ups their game significantly. It also helps them see how they affect people. All high achievers, by the way, Brad, have an emotional wake. All high achievers have an emotional wake that they actually push out to people. Many times, they’re not aware of that though. They’re not aware of how they actually affect people, so we begin to have them journal in the meeting and look at people’s facial responses. They actually had me evaluate their meetings. That’s another best practice tip there is they actually journal how they affect people in meetings. In the beginning, we turn on filters in them. Are you watching how you’re affecting your clients? What are your client’s facial expressions? Are you sure that you’re engaged with clients? And we have them begin to study their own effectiveness with their clients, their staff, their team members, their existence, even at home. [00:18:58] Brad: What are some common mistakes you see maybe even specific to financial advisors that they’re completely blind to until they start to study, “Hey, how am I impacting the people across the table from you?” What are just common issues you run into? [00:19:12] Greg: Common number one is they’re offering services that they haven’t checked the need if the client wants those services. They’re just offering those services without checking for the need first. It’s always better to map services with need. That’s always the best way to offer your services but they haven’t even taken 30, 60, 90 seconds to see if that’s a need. And it’s interesting as you kind of mention what you run into in financial services, one of the common things we’ll talk about in our coaching sessions as we go through what should a first appointment, second appointment, third appointment look like is we’ll literally say if you had a stopwatch and you were timing as a financial advisor the amount of time you talk in the first appointment versus the amount of time your prospect talks, what’s that ratio look like? And for a lot of financial advisors, it isn’t pretty. I mean it’s probably at least 75%, 80%, 85% in the conversation. So, what are ways to flip that script in and go back the other way where you’re actually asking questions and seeing what issues you can solve as a financial advisor? [00:20:54] Greg: Brad, he who ask the questions leads the meeting. He who ask the questions leads the meeting, not he who’s talking so essentially a lot of financial advisors are capped in their earning income as well as their effectiveness because they’re talking way too much and they’re asking too little questions. If you really want to lead a client, you got to ask some questions and so that is a big, big key is to recognize the power of questions, the power of asking a powerful question. The question engages someone, a question focuses someone, a question honors that someone, a question gives you the opportunity to know where to go with that client. You don’t really know where to go unless you’re asking questions. And so, we try to train our advisors to understand the power of questions and we even have an online video series. By the way, it’s free, Brad. If people want to access it on some of active listening powerful questions that I can actually give you that link if people can go on and learn how to become. And then you’re going to see your income, your effectiveness, your clientele is going to continue to rise rapidly just by those two changes. [00:22:09] Brad: Awesome, Greg. We’ll definitely put that in the show notes for everybody listening in. If you are a financial advisor, let’s just play pretend here for a second. So, you’re a financial advisor now, what would be one or two or maybe three questions that you would incorporate into your first meeting that would be powerful questions to ask? [00:22:27] Greg: “So, Brad, thank you for coming in today. It’s so good to meet you. I’ve enjoyed hearing about your family and I’ve enjoyed hearing about your short-term and long-term goals. Tell me today how you feel I can assist you the most. How can I assist you today the most?” That’s the first question because I’m not forthcoming and showing that but, “Listen, Brad, sit down. I have a plan for your life. Be quiet. This is it, buddy.” I’m actually asking him first to come forward and then secondly, I think a second question would be, “Now that we’ve chosen a few services that may assist you, tell me what you’re ready today to move forward with.” Now, that’s probably people will say, well, I already asked that question but notices the second question, not the first question. [00:23:13] Brad: I like that. That’s good. It’s interesting. One of my favorite questions is like it’s like the alter ego to your first question it was, “What was one of the things that concerned you most that brought you into my office today?” Because a lot of times you have people come in because there are anxieties around retirement or saving or do I have enough which is interesting. You took like the glass-half-full question and the one I’ve heard use a lot of times is kind of the glass-half-empty question. So, is there a certain reason you use the kind of the positive side of the coin there on that question? [00:23:44] Greg: I just like the client to feel like they are coming to receive services they’re asking for. Yeah. And so, I just want to honor them first. This is very relational sales orientated what you and I are talking about right now and it obviously is a sales strategy from what I think is one of the most successful salespeople that I ever – and we work with a lot of them, usually are very relational in their sales, they’re high listeners, and they also before someone leaves, will always ask this question. Is there anything else that I can do today to assist your personal and professional success? Anything else that I can do? One of the things that I appreciate about Cathy Mendell who we utilize for our personal finances, our corporate finances is that Cathy is a very good listener and she’s a very good restater. She restates what we’ve said so she restates that, and she always gives advice based upon what we’re asking for. So, it’s very focused advice which I think is one of the reasons why she is so successful. [00:24:52] Brad: Yeah. Well, okay. So, now you brought up Cathy. So, now we have to dive into this a little bit. So, we were talking before we went live here, and it was over dinner. It was over a glass of red wine I think when you came in Topeka. Somehow, we connected together that Cathy who’s an Advisors Excel client, long-time super successful lady out of Bend, Oregon that she was your advisor and so I would love to share, it’s always fun, successful people like yourself how did that relationship come to be. [00:25:23] Greg: So, if I could remember correctly, Cathy had a free webinar I believe. No. It was a free live event that my father-in-law who’s a very successful businessman went to. He and his wife went to that, really enjoyed Cathy as a person first and then enjoyed what her philosophy and approach to retirement and retirement services then they quickly dialed us up and said, “Greg and Diane, you have to meet Cathy. She’s going to really be able to assist you guys,” so then we went to the event and met Cathy and her team and then just begin with our brand-new company at that time begin to go and Cathy has grown with us all the way through the years of a brand-new company, our old personal retirement funds. Now we have multiple funds that are cash balanced plan here at Coachwell and she’s helping us manage those and just has helped us continually grow, giving us business advice, good business advice, sound business advice as well as how to best invest our resources for the best returns. [00:26:50] Greg: Cathy expresses immediately that, “I’m here for you. I’m here for you.” Now she does it in a few different ways, but you can really tell that she is an advisor who wants to be an asset in your life. She wants to be in that journey with you and she really cares about your success. So, you pick it up right away so it’s very intoxicating, right, Brad? I mean it’s like of course, I want to work with Cathy. She is on our team. She wants to really help us see that to get to those long-term goals we have, because retirement is a long-term goal. So, you can tell that she really cares about you, cares about your success, is not just there to build her own business. [00:27:34] Brad: So, let’s go back because I’m sure you have more than one financial advisor in your life. Are there turnoffs that have been the opposite of that in our industry where you just been like, “Wow. I can’t believe this?” Going back to the self-awareness thing that we’re talking about here, are there certain things you’ve seen in other meetings with other financial advisors where you’re like, “Wow, this came across. This is how it made me feel,” and the individual wasn’t even aware? [00:28:00] Greg: Yeah. I can tell you one that we fired because it just came to mind. I thought I shouldn’t say fired. We released him. [00:28:06] Brad: Politically correct version of firing. It wasn’t you. It wasn’t me. [00:28:13] Greg: The one that we released, it comes down to that second enemy which is life mismanagement and it’s like I’m coming to meet with you and I like you as a person but, my gosh, your life is out of control. So, this person did not have life management skills. They did not manage it well and that may be concerning to me. “Okay. We’re going to handle over a lot of assets here for under management with you, but your life doesn’t seem to be – it is not together. In fact, I can tell it isn’t.” So, I think that’s a key too is that not to put forward this fake, I’ve got everything together, but I think it’s really important that you do have your life together. [00:28:57] Brad: So, it sounds like he didn’t have his own house in order or she didn’t. What were the signs of that? What were like, wow, that may be an advisor might not even notice that a client picks up on? [00:29:06] Greg: Yeah. We made an appointment and they were always late, running over, kind of apologetic all the time, and a little bit of that absent-minded professor-type persona as well as just you can tell that things were just in a disarray. You just see the disarray mentally as well as the office as well as just life is just not put together well. [00:29:30] Brad: Kind of bled through to the staff and how that was managed as well? [00:29:34] Greg: Exactly. Yeah. The staff wasn’t run well. The business wasn’t run well. There just wasn’t a professionalism there. So, I think business acumen also is important in this role. Again, you and I are not telling advisors something that they don’t know but obviously if you’re going to attract high net worth clients, they pick up on these things immediately like in the first 30 to 90 seconds, right? So, I think the key is that, that is really an important piece to be aware of. [00:30:01] Brad: Yeah. And the higher the net worth the client, the more they’ve been exposed to great businesses and where you’re getting compared to all of those great business experiences whether it’s a luxury car dealership or Ritz-Carlton or whatever, those may be so then you really have to step your game up. [00:30:18] Greg: Yeah. I’ve always said, if you’re going to be serving people with their money or their children, you better be sharp. So, I mean, it’s just those are the things that are just, so I think that that’s a key and obviously if your ego or confidence is in the right place, if you’re practicing gratitude then if you really are giving yourself time then that’s a key. If you’re a decentralized leader where you’re empowering team members letting them be self-directed, you got the time to invest in yourself. Therefore, you were at the top of your game. You have good life management skills. You’re not susceptible to the enemy number two which is life mismanagement which leads to now broken relationships, self-indulgence, so you can see this. As you get higher in the ranking of those enemies of excellence, Brad, the disorientation of the person gets higher, much higher. [00:31:15] Brad: You actually wrote a description of unfortunately what I’ve seen in advisors over the years actually I didn’t mention the second piece of this. “Egotists are known to burst into staff members offices unannounced with time-sensitive requests, not even sitting down to discuss, but rather barking out orders as they march off to the next office to repeat the same behavior,” but their time is critically important, right? So, it’s kind of this valuing of my time is more important than yours and what’s sad is I’ve seen as I read pieces of this, full transparency, I’ve seen pieces of myself in this writing and so it’s a good, it’s a really good reality check to make sure that as you see yourself sometimes on a busy day falling into those habits making sure that you’re not continuing good on that path because it’s obviously not going to endear your staff to you by any means. [00:32:05] Greg: Yeah. I started doing a self-check daily. I do a self-check in my office alone before I go home, “How well, Greg?” Because I’ve had those same tendencies. I mean, I wrote this book. It doesn’t mean I didn’t live by this book. Heck, I have. I do a self-check every day and I evaluate my performance and my attitudes, my mindset, and my behavior. Attitude, mindset, behavior. I check those, and I actually write down what I did well that day and what I did not do well that day and I reset every day. I think we need to give ourselves that permission as leaders, let’s do a reset every day, and give yourself a chance to improve that tomorrow. Maybe we didn’t respond well to a team member or a client that came in then, well, then we improve that tomorrow. So, I think doing a self-check is a really important best practice if you’re going to become that top advisor who’s practicing excellence. You’re going to have to do a self-check daily. [00:33:03] Brad: Yeah. And then give yourself permission if you screw it up, hey, there’s tomorrow, right? So, we can try again. [00:33:09] Greg: Yeah. This doesn’t define me for life. It just defined me today so what don’t I tomorrow give myself an opportunity to practice greater effectiveness tomorrow? [00:33:19] Brad: Hey, Blueprint listeners, I have a special opportunity for you this week. I wouldn’t interrupt the middle of an interview otherwise. We are hosting an event at AE Headquarters that is the first of its kind, May 30 through June 1, 2018. It’s focused on how you as a financial advisor can make the leap from traditional old-school marketing to the new digital frontier. I just checked, and we have less than five seats remaining for May’s event and due to demand, we’ve actually scheduled a second. So, if May does not work, go ahead and apply anyway if you’d like what you hear after this. We’re going to focus on how to break away from old traditional marketing tactics and learn what’s working for some of our top clients from across the country when it comes to new strategies on Facebook that are driving prospects to your events. Even better, it doesn’t require you to pay for a meal. Here’s a bit of what we’ll cover at the event. First, we’ll have Brad Parscale, the actual Facebook marketing expert who helped run Trump’s Facebook marketing campaign during the election. I might add this isn’t a political conversation where he’ll be discussing right or left. It’s just going to be a deep dive into the tactical overview of the strategies that drove results using social media. Next, we’ll have the digital marketing firm that is consistently filling our client’s events with 40 plus prospects per evening. Incredibly, they’ve only missed maxing out this number four times in over 400 campaigns in the last three years. All attendees are being invited directly from Facebook ads with an online registration process to an educational event, once again, no dinner being served. They’ll show you exactly how they are doing it including something called a look-alike audience which is a tool you can utilize on Facebook to clone your top clients. More on that at the event. Then of course, once you get a qualified attendee to show up, it becomes about the automated follow-up process you have in place to get them to your office. We’ll have an Infusionsoft expert in to share exact campaigns working today in financial services. If you aren’t familiar with Infusionsoft, you should be as it’s changing the game for our clients. [00:35:20] Brad: Lastly, we’ll have two of our top performing offices which gathered 233 million and 97 million organically in 2017 sharing their real-world marketing ROIs, how they consistently keep their calendar full, and the key to scaling your firm, so you’re no longer a salesperson or asset manager for that matter but rather a CEO. If you’d like to see if you qualify to attend, take five minutes to fill out a short application online at BradleyJohnson.com/TheCatalyst. For those that qualify, we’ll fully cover your cost to attend including flight, hotel, and attendance to the event. And with that being said, this is the first time we’ve ever done an event fully focused on digital marketing, so this obviously speaks as to why we’re essentially full for this event with only a few seats remaining. So, if you want to be there, don’t wait. If you want to be there, go fill out an application at BradleyJohnson/TheCatalyst to save your spot and I will be looking forward to the opportunity to meet a few of you face-to-face. [00:36:25] Brad: Cool. Okay. So, we’re going to move on from ego but on Page 29, what I love throughout this book is you did, speaking of tests, you put little tests in here so there’s an ego evaluation Page 29 and maybe I might even convince you to share that with our listeners if I handle the rest of this conversation right. So, we’ll see if I can talk you into that because I think that’s a really – that’s a killer piece of the book. Since we don’t have all of the time in the world to get through all of this, I know you just hit on enemy number two which was life mismanagement. Do you want to dig in more there? Are there other pieces or enemies of excellence you see in financial services that you’d rather dive into? [00:37:05] Greg: First, I would like to say yes, so enemy number two is life mismanagement. Here’s the challenge with it. As high achieving leaders, we think it’s optional. “I’ll get around do that. I’ll get that working on it later. I’ll go ahead and eat better sometime. I’ll hydrate better at another time. I’ll invest in those key relationships at home knowing that relationships never go on hold.” There is no hold button for relationships. “I will get back to improving my sleeping patterns. I will, I will, I will get…” No. And we don’t. What we don’t understand is we’re losing our ability to perform at our highest level every day if we don’t address the life management issues in our own life. I’m not talking about perfection here, Brad, at all. I’m talking about being a practitioner. We’re life, living well, practitioners. We’re practicing daily on how to have more vibrancy and lead from a position of strength. It’s really easy to lead from a position of weakness, puffed up by another coffee cup or something worse where we don’t want to be strong men and women. We want to be strong men and women. And so, the key is this is not optional. If you want to perform at your top level, you’ve got to invest in yourself in this life, management, health, vitality area. It’s not optional. [00:38:35] Brad: That chapter reminds me a lot and one thing that is beautiful about sales is you get exposed to a lot of books that are just about personal betterment. And Jim Rohn I remember in the early days he had kind of a wheel of success where you could kind of rank yourself on each of these different areas of your life whether it’s business, relationships and what I think you hit on very well there is you can be sitting there giving yourself excuses about how you are dedicating all this time to your financial services practice and growing it. Yes, you’re making some sacrifices short term but, I mean, you share an incredibly powerful story of infidelity at the very beginning of the book that when you get too far out of balance, these other things start to creep in and now if you’re going through a divorce or if you’re 100 pounds overweight there’s no way you can operate at your peak level for business when you’ve got all of that other stuff going on in your life too. So, it’s almost like you can kind of rent some time but it eventually catches up to your – I don’t know if there’s another way that you phrase it in the book that that’s different than that but that’s what I took out of that chapter is you can’t borrow from these other areas of your life to sacrifice there. [00:39:46] Greg: Brad, I had the story. I sat in this conference room at an executive team meeting at a $5 billion corporation and watch the CEO come in who was not in a good place and I watched him literally destroy that lead team in a matter of minutes, ended up losing many of those lead team members that he had built over the years, lost them. So, this best talent walked out of that company because of a bad meeting and it only took about 10 minutes. It’s about a year-and-a-half to build a house. You can burn it down in about 10 minutes. [00:40:21] Brad: And you were actually sitting in the meeting as this was all going down? [00:40:24] Greg: I sat in the meeting. I was trying to give him signals. I was trying to assist him and he just – he blocked us all out and it was just – it was the very person who should be in that meeting building up that lead team was the one who had become the saboteur, who was tearing it apart. And I know exactly why. It was because he had been letting go of that life management so long that he became disorientating with reality and it had been much better if had just canceled the meeting. Seriously. It took years to rebuild that. In fact, he was the very senior vice president who turned that corporation around, left and went to other companies building them and it took him five years to get back to traction. That ten minutes cost him five years and hundreds of millions of dollars. So, what I want to say is maybe yours is not that catastrophic but what I would say is, please don’t misunderstand, the value of a life lived well is extremely valuable. You will talk different. You will respond different. You will attract people differently. These high net worth clients that you like to attract are waiting for you to live better. [00:41:39] Brad: Where do we go from here? We’ve talked about enemy number one, ego; enemy number two, life mismanagement. We’ve got five others and not enough time to cover them. So, you want to hand select maybe one or two others that you’ve seen may be abused in the financial services industry? [00:41:56] Greg: What I would say is this. The next one is bad habits, so I just want to point out that the next five are all decelerators. We can really turn things around, Brad, in levels one and two, ego, making it more altruistic to build something great for people and then life management, we can definitely address that quickly. But if we don’t, what it leads to is bad habits and bad habits breed like rabbits and what happens that begins to – and this now heading towards indulgence because we’re attracted to some indulgence and that begins now the unraveling. When you see someone, and the company has failed, or they asked to leave where you see them worse on TV or in the news that this is what happened. They didn’t address it at first two levels, now levels bad habits leads to indulgence, broken relationships, self-sabotage. It’s all disorientating. So, what I want to say today without going into those is that if you see in your life bad habits, you’re a stage 3 risk, it’s time to quickly grab counsel around you. So, to protect from levels 3 beyond, bad habits, self-indulgence, broken relationships, I mean colleagues leave you so many times, spouses leave you, I mean, all your advisors leave you because they know that you just will not listen. What that’s telling you is that you had not open to input. See, it’s so critical to have a trusted core group of people which I talked about in the book, Brad, to have a trusted core group where you practice self-disclosure with. We need outside insight desperately. And if we identify those people slowly, by the way, you can’t just select them tomorrow. We have to select them slowly over time but surround yourself with great counsel. Get that counsel of core advisors around you and practice self-disclosure with them. Receive their counsel. Let them speak into and that’s what’s going to guard you from Enemies 3 to 7 and the destruction that ends up there, very few people ever return from Levels 4, 5, 6, or 7 to the level of success they had prior to it. Very few have ever. [00:44:14] Greg: I just throw into a great direction. So, issue number one is they hire six months or a year after they probably should have so going back to taking time to build that team that didn’t happen but now how I’m hardwired that I’ve done it all myself and now I have to completely flip on a dime and start to know how to lead people and how to delegate and things like that. So, this could be a really long conversation but a couple of key things I would love to take your input on. Starting with hiring because I know you guys also run a firm that hires and the proper way to do that. What would be some tips for financial services if these are my problems? I have high turnover, I have a tough time finding the right people on my team, and then once I do hire, I tend to kind of run them off. So, I know that’s a really big broad question I’m throwing a lot at you here but if you were just going to speak to that and give sage advice to financial services, what would that sound like? [00:46:03] Greg: The first thing to do is please sit down and let’s not permit it and recognize you’re running so hard that you are capped. Many times, we had this mystery that we play out, this mirage, Brad, that just because I’m active means that I’m productive. Not necessarily. You’re hitting a plateau. If you sit down and begin to evaluate, if I could peel off certain activities, what would those be? Because my greatest asset is probably meeting with new people. That’s probably the greatest asset that I have. Well, all the logistics and all those detail, areas that need to be done by someone else, I’ve got to identify what they are. If you have to just write them on a napkin at Starbucks, do it. Write down what you could have someone else do that you don’t have to do or shouldn’t do and now begin to, we can help you, someone can help you, begin to identify the profile of that person, ask someone to help you build a profile for that person and then hire to that profile. Many times, we do is we hire people we like just because we like them, but they may not have the right behavior sets, skill set to service that profile that we put on that Starbucks napkin or that yellow notepad. So, you got to have someone. You got to first sit down, write down all that you can have someone else do that don’t play profile and then begin to hire the right behavior style to that profile. Then also recognize you’re hiring someone different than you. They’re not going to be you. We don’t want to hire you unless you’re hiring other reps. If you want support services, you got to hire someone who’s different than you and just be quickly, I’m just going to continue this right now, quickly begin to appreciate their differences. High net worth drivers, high achievers like myself, we don’t always appreciate them and that’s why we run them off. They just need a little bit of appreciation. Just throw a little bit of appreciation once in a while and they will stay because they want to stay and serve but that’s my quickest off-the-cuff response to that question, Brad. [00:48:18] Brad: So, you just said something in passing there that I just have to hit on, something that I’ve done horribly over the years but I’m trying to get better at and something I just see happen a lot in financial services. Appreciation, it takes you literally the time, you see, I think as people type A personalities would always we see as the stuff that isn’t good. They did five things good but here was the one mistake they made that I never would’ve made, right? But if you just take the time to actually acknowledge and say, “Hey, that was really awesome that you did that by the way. I really appreciate that you did that,” it’s amazing how that multiplies that action. And so, what did it take? It took 30 seconds of you acknowledging it and so that’s one thing I just want to point out is I’ve seen that over and over is some of the best leaders in our business are the ones that take the time to acknowledge and appreciate their staff and then, weird, they actually like you and want to work for you. [00:49:15] Greg: And they stay, and they perform to higher level, oh my gosh. Well, affirmation is the most underutilized free tool in a leader’s toolbox. It has to be accurate. I just want to say real quick. It has to be accurate. You can’t just walk through and say, “I think you’re amazing, Brad. I think you’re just one of the best people I’ve ever met in my life.” That’s nice. That’s not accurate affirmation. Let’s be accurate. “Brad, the way that you handled that event, the way that you set up that podcast, you have that guest and the questions you asked and the way that you’re able to draw more out of that, that was amazing. That was at a high skill level, Brad, and I greatly appreciate that.” That’s accurate affirmation, correct? [00:49:54] Brad: I hope so, Greg. [00:49:55] Greg: It is. I’m just saying it. It has to be accurate. As long as it’s accurate, it also recognizes you are fueling that person. Sometimes why do you tell people? You’re fueling that person for a month, three months, six months by that one accurate affirmation. You are giving them fuel to run on. [00:50:11] Brad: And one other thing. If you can do it in front of other people, it’s even 10 times more powerful from experience, maybe 100 times. [00:50:19] Brad: How do you, this is a really easy question. It’s not. How do you take someone that is a type A personality that as soon as a mistake is made and we are in the high trust business, right, so if you, for example, are moving $1 million to me and trusting me with your life savings, if something doesn’t get filled out properly on the paperwork and causes unneeded delays or you have to go back to that client and don’t look like you’re paying attention to their life savings, that’s a stressful situation. What are ways that you can as a financial advisor coach to not just diving right back in and saying you screwed this up and actually allowing people to make mistakes as they learn? Are there certain tools that you try to give your clients there? So, just use every client mistake as an opportunity and train your staff to actually do that. Let them do it. Let them use every mistake as a client building opportunity and clients love it because you’re open, you’re honest, you’re not trying to – we’re not associating blame back to them or we’re not saying it was because so-and-so got sick that day. We just go ahead and hammer right up front and I found that those situations can sometimes bond clients to you even more than if you didn’t make a mistake. It all depends on how you respond to that mistake. [00:52:20] Brad: That’s gold right there. Thank you for sharing that. It’s so true. I found in the lowest moment if you handle it properly, it can actually endear your clients to you that much stronger. [00:52:31] Brad: And you’re honest like you’re honest, you’re upfront, you didn’t deny that you made a mistake. “Hey, we made the mistake. We’re sorry but we’re going to make it right and here’s a little something to say we’re sorry.” So, I love that framework there. didn’t lose their leg because of that mistake or someone didn’t die because they weren’t responded to. We gave them the wrong medication at the wrong time. So, I always say, if we were in the ER, there are higher level mistakes, I mean, but we’re not in the ER. We are in the business of building people’s lives, but mistakes are going to happen, but no one lost an arm today, no one did lose a leg today. We can definitely correct this and do it at a positive client building. Attachment, we’re going to have them attach to us even higher. [00:53:17] Brad: All right, buddy. This is fun, but all good things have to start to come to an end. [00:53:21] Greg: Yeah. I’m sorry about that because I’m having a great time, Brad. [00:53:25] Brad: If you’re good, we’re going to transition to and this will be my last go buy the book. Unfortunately, I was reading both good and bad that I’ve seen in our industry in this book. I’ve seen the upper performing offices that have figured some of this out along the way, how to properly lead then I saw some biographies of some people that I’ve seen in our industry. So, please go buy the book and, shoot, I might even send a few out to those of you listening in. So, Greg, are you good for some philosophical questions here? [00:53:55] Brad: Okay. So, being an author, I want to ask you this question. What’s the favorite book that you’ve ever read and how did it impact your life? [00:54:04] Greg: I think the favorite book I read is The Five Dysfunctions of a Team by Patrick. I think what it did is it lowered this fear level of, “Oh no, my team has a dysfunction. I have the wrong team.” Oh no, every team has dysfunction. Why don’t we find a great solution to work around it? Because I love the power of team. There’s so much you can do with – team is your most competitive advantage in the marketplace, it really is. We think we are many times as top achievers? It’s really our team. So, for me, I was just encouraging to be able to as a consultant, as a coach for so many corporations over the years I may be able to go in there and say, “It’s okay. We’re going to work with that dysfunction because every team has it but we’re going to help you maximize the impact and output of this team. With a highly engaged team, there’s nothing that can compete with it in any industry anywhere at any time.” So, for me, that was just a gamechanger in my whole consulting world. [00:55:01] Brad: The was the first Lencioni book I ever read. And what I love, and you actually used – I’m going to give you a compliment. There were pieces of Lencioni’s writing that I saw in your book because he does such a great job of turning it – it almost feels like you’re reading a fiction book because it’s so engaging with the stories that he tells that it all applies to the business world and it comes from him. Like you said, being the guy that doesn’t leave home without the notebook and he’s studying real-world case studies in business that he’s seen. So, yeah, that’s a great book. Okay. When you hear the word successful, who’s the first person you think of and why? [00:55:38] Greg: I’ve always loved Ronald Reagan. I know many people do. I love the fact that he was able to move from an actor skillset to a leader skill set to one of the greatest leaders of the free world in my opinion in modern history. I just admire him. I think his tenacity was amazing. So, I think his tenacity, stand up, I’ll never forget when he was shot. We were in college and I remember that day watching him get shot, just how he handled that whole situation and still came back and led strong. So, I think that fateful sacred leadership trust that he really gave as an example to live by, I just really admire him. [00:56:28] Brad: Yeah. He was definitely a president that you were proud that he was president of the country. [00:56:33] Brad: The way he carried himself. I was a little grade schooler. That was actually the first president I remember being president, but I remember being proud of Ronald Reagan for some reason even as a little probably seven, eight-year-old at the time. [00:56:47] Brad: What is something that you would like to see considered absurd 25 years from now? [00:56:52] Greg: That texting and email is a high form of communication. It’s just absurd. I mean, I think when I get concerned about today is we’re losing the art of dialogue. When I was growing up in the 60s and 70s, I’m turned to push my age out here now, when I was growing up in Los Angeles, our front porch was actually used to sit down and interact with people. Men and women would come home at 6:00 for dinner because many businesses closed, most did. You couldn’t do your work anymore because your work – we need to do work was at work. No internet, no cellphone. Okay. So, the key was people would cross over at night after dinner and sit in people’s porches and talk. I’ve sat and witnessed and learned the art of dialogue. Dialogue, financial advisors, my friend, is the key to your success and raising your success level. I know that text helps us to schedule a meeting or to get something across quick, email’s good for sending information back and forth, but your secret to unlock your success and move to a different level is going to be in your ability to have ongoing engaging dialogue. To me, that is the secret to people’s success today. [00:58:07] Brad: Yeah. I want to add just like one thing on to that because you’re so spot on especially as I look at a seven-year-old, a six-year-old and two-year-old and raising them in this world. That’s going to be one of the hidden keys in my opinion of the generations of kids that I’m raising is what are the ones that can actually look you in the eyeball, speak to you like a human being, shake your hand and not be the kid that pulls out their iPhone two seconds later and is living in some imaginary world with friends that aren’t there. And I think truly as I raise kids, that’s one of my biggest challenge is how do I make sure that happens that they’re not communicating just electronically with everyone? So, any tips? We need to take those offline because I know you’ve raised a couple of successful boys. [00:58:50] Greg: We just spend a lot of time talking with them and especially two middle schools and a high school. Please don’t back off. That’s the time to lean in. That’s the time to grab them. Even when they’re disrespectful, just grab them and hug them anyway and sit down and talk with them. Because they’re working through that breakaway unto independence, but they desperately need you even though they seem to not act like it at all. [00:59:32] Brad: Yeah. Well, one other thing I just want to, it’s a personal rule that I set a few years back because I found myself making this mistake, I made a rule in business that any negative communication that I ever have whether it’s a client, whether it’s a team member, never happens electronically. It never happens through email, text. It’s a face-to-face conversation just because you don’t, there’s no body language that can come through. And so, that’s something that I made some serious mistakes on early on in my career and that’s really helped a lot, so I think that applies to the no texting, no email rule. All right. Here’s the last question I have for you, Greg. What is the one piece of advice you can share with the audience that’s led to your success to this point? [01:00:18] Greg: Henry David Thoreau has his famous saying that, “Men lead quiet lives of desperation,” but that’s only half of this quote. The other half is, “And go to the grave with the song still in them.” That song is people’s passion. Thoreau looked around as a philosopher and saw men and women leading these lives of just surviving, just working, working hard, trying to make things work but they didn’t let their song, their passion come out. My greatest if whether the level of success I have today, Brad, is I try to live every day in my passion, expressing it, enjoying people and having that express that song. If that song has ways to sing and has melody and I can sing it and I can have expression, then I am an engaging, effective, tremendously impacting person. So, I would say to all of our leaders that will watch this, please let your song, find it, let it out, express it in your work, allow yourself every day to live and serve with passion. That’s where the impact is going to be. That’s where the fulfillment is going to be found. That’s where the sustainable success is going to be nurtured is having that expression of that song so you’re not a desperate person, just surviving. [01:01:37] Brad: Great advice. What’s fun, we definitely have some overlap in our careers here because obviously, I’m coaching financial advisors on a daily basis. You’ve lived the coaching world for most of your professional career. It is so rewarding and just as you speak to that, it’s been really fun for me over the years. Number one, you can’t coach someone that’s not going to be – any success that we have as coaches, it all still goes back to our client because you can give advice and maybe tools and frameworks and all that you can do but if you don’t go execute on it as you and I both know nothing really becomes of it, but it is really rewarding to say just a little piece of where they went from here to here, wow, that was really fun to just speak into that a little bit and let that song come out. So, I just want to thank you, Greg, for carving out some time here. I know you stay very busy and, shoot, I might be keeping you from the slopes right now. So, thank you for hopping on here and sharing with our audience. So much came from this conversation so I’ll be giving it to relisten multiple times and pulling some things out for my business. So, thank you so much. [01:02:42] Greg: Thank you, Brad. It’s a real honor to be here today and thank you for this time as well. Thank you. [01:02:47] Brad: All right. Until next time, Greg. Take care. [01:02:49] Greg: All right. You too. See you. [01:02:56] Brad: Thanks for checking out the latest show. I really appreciate the reviews as it helps me figure out which guests resonate with you all and it helps the show get discovered. Also, a quick ask, if you haven’t left a review yet, we are literally two away from the 100th review mark. So, if you want to help push us into the triple digits, we’d be forever grateful. Wow. Thanks for the review and the kind words. I mean that’s the type of review that when I started this thing out, I would’ve dreamed of getting. So, I love that the podcast is your go-to source for industry knowledge and your thoughts on starting the day earlier and turning off the radio takes me back to an advice I received from Darren Hardy many years ago. With the amount of time that most Americans spend in their cars, they could literally have a Ph.D. of their choice within a year or two if they had simply chosen to educate themselves rather than listen to music or talk radio and that’s exactly what you’re doing so stay after it. It will serve you well. I promise. [01:04:54] Brad: The next review comes to us from I have no idea how to read this so I’m just going to spell it, Jepuchimihn, who says, “Incredible perspective on how we are heard. I was blown away with Michael Port’s awareness of how he is perceived on stage and ability to translate that to how we as advisors are experienced by our clients at events and in meetings. To deliver a message that matters, he gave an example of pouring over 500 hours into making the meaning come to life. Just think how my clients might benefit if I took the top three financial topics that matter most to them and put that energy into making sure they receive that message. Thank you.” Thanks for the kind words and taking the time to leave the show a review. Michael Port’s advice is spot on. I’ve seen him literally transform our client’s presentations within 30 minutes of working with him. Night and day difference. So, for those of you out there who missed that episode and grow your business by speaking from stage, be sure to go back and check that one out. He is a master of his craft. Next up is harmonma who says, “Advisor. Great podcast! You continue to bring interesting and relevant guests. Every podcast has at least one actionable event or a great takeaway, sometimes two or three. I love Michael Port. My presentations have changed since I first heard him. My seminars improve every time I listened to his work. I got to meet this guy.” Thanks for the review. More well-deserved praise for Michael Port. He is the man. Glad to hear his advice is helping you out from the stage. Michael’s framework is the best when it comes to engaging an audience. [01:07:01] Brad: Thanks for listening in, Andrew. I love seeing the compound effect of this show inspiring other advisors out there to start up their own and you doing an incredible job with yours as I’ve had a chance to give it a listen. And I know we had some fun conversations on the front-end as you were trying to figure out how the show format would lay out and how to have the most impactful conversations on your show. So, I’ve got to say you delivered there. And I’ve got some exciting news coming out on that front on our side very soon. So, for those financial advisors out there wanting to start a podcast, stay tuned. More to come there potentially on an upcoming episode and, Andrew, I appreciate you taking the time to leave us a review. Thanks, man. As we wrap the show, just have to say that I love reading each and every review so thanks for taking the time to send the love via the Internet and for those of you out there that have interest in diving deeper or figuring out how we may be able to have our team help you implement many of the ideas shared on the show, my day job just so happens to be consulting financial advisors from all over the US on how to grow their business and design a practice that serves them versus being a slave to their practice. Yes, it’s possible to grow your business and work less. This is a model we’ve replicated over and over in markets all over the country so if you’d like to apply to see if this makes sense for us to have a one-on-one conversation, you can do that at BradleyJohnson.com/Apply. It takes about five minutes to fill out the application, so we can understand what your business looks like, what challenges you may be facing and how myself and my team may be able to help. We then dive into a discovery session where we ask a lot of questions based on your survey. We do a lot of listening and take a lot of notes to see where we may be able to dig in and go further. Taking the first step is as simple as applying at BradleyJohnson.com/Apply. So, that’s all for this week. Thanks for listening and I will catch you on the next show. [01:08:53] Brad: Thanks for listening to this episode of the Elite Advisor Blueprint. For access to show notes, transcripts and exclusive content from our show’s guests, visit BradleyJohnson.com. And before you go, I’ve got a quick favor to ask. If you’re liking the podcast, you can help support the show by leaving your rating and review on iTunes. Not only do we read every single comment, but this will help the show rank and get discovered by new listeners. It really does help. Thanks again for joining and be sure to tune in next week for another episode. This is provided for informational purposes only. Producers are ultimately responsible for the use or implementation of these concepts and should be aware of any and all applicable compliance requirements . Results from the use of these concepts are no guarantee of your future success. Please be aware of and abide by any and all applicable gifting limitations.